If you suffer from arthritis, chronic pain or sports injuries, then Platelet-Rich Plasma( PRP) treatment might be the perfect solution for you. In contemporary medicine, doctors use PRP therapy for injuries and various types of chronic pain. PRP injections supply injured areas with natural cytokines, stem cells, and other bioactive growth factors that boost healing. The treatment is carried out with the help of the PRP substance taken from a patient’s own body and then injected into the damaged area (e.g., tendons, joints, ligaments). PRP substance differs from an ordinary blood sample as it contains higher concentrations of cell ratios and platelets which have bioactive factors that boost natural wound healing. PRP injections lead to local inflammation and a wound healing ensured by bioactive proteins, white blood cells, plasma, and new collagen deposition. New collagen gradually tightens the damaged area making it stronger. Research shows that PRP stimulates cell replication, vascular endothelial growth, proliferation of myoblasts, and insulin-like growth factor- 1 that repairs muscular and skeletal structures. Plasma proteins such as fibronectin, vitronectin, and fibrin also contribute to the repair mix. PRP injections have been used in orthopedic treatments since the early 2000s. They also included treatments aimed at reducing chronic pain and joint deterioration. Many sportsmen like Tiger Woods, Hines Ward, and Cliff Lee have already used PRP treatment to speed up recovery from their injuries. Additionally, this revolutionary therapy has also been used to treat hair loss. You can use PRP treatment for sports injuries like tennis elbow, torn ligament, and common injuries that affect the rotator cuff. It’s also a great solution for those people who have arthritis or osteoarthritis. Office workers who experience consistent neck and shoulder pain or have common hand injuries can also benefit from PRP therapy. If you want to learn more about PRP therapy for injuries and pain, schedule an appointment with one of our specialists. We will assess your health condition and figure out if our PRP treatment is right for you. ​If you want to take advantage of this therapy, you will find the solution at the iuventus medical center. 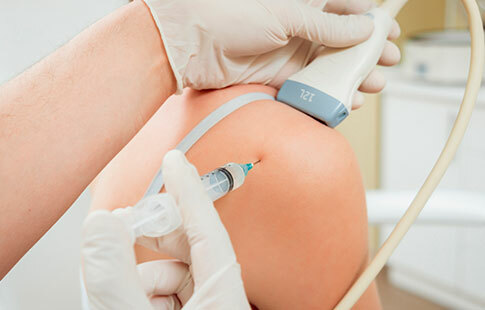 We care about your needs and can provide you with an opportunity to get PRP Injections for pain relief in Las Vegas!